Thanks to Spanish explorers and Native American, wild Mustangs roam throughout various regions of the United States. They are guarded and managed by the US Bureau of Land Management (BLM) along with the US Forest Service (USFS). Since the transit of the Wild Free Roaming Horses Act of 1971 the BLM has put more than 207,000 wild horses in ranches all over the country. Adopting a wild Mustang can be difficult but if you follow some basic guidelines the procedure can be simplified. First of all, download the adoption forms from the BLM’s adoption site. Complete the application form and mail it to your nearby BLM office. You need to be a minimum of 18 years of age. On the other hand, you should not have prior convictions for inhumane treatment of animals or for violations of the Wild Free Roaming Horses Act. Also, you should prove to them that you can house and care for a Mustang effectively. After that, prepare a barn or place to house the wild Mustang. In order to qualify to adopt the animal you should offer a facility of at least 20 feet by 20 feet wide and six feet high. The corral can be created from sturdy poles, planks or pipes. Make sure that area between the rails should be not more than one foot wide. Moreover, you need to provide a shelter that will properly safeguard the horse from various climatic conditions and wayward temperatures. Be patient and wait for a representative from the BLM to call you. They will check the adoption process with you and confirm that the barn meets all the minimum requirements. After you are given the go ahead for the adoption, you can start looking for a wild Mustang to adopt. Furthermore, choose a horse that meets your training goals and do not just pick one because of the animal's colour. You can choose a Mustang off the internet from BLM’s online adoption setup. Be prepared to pay on the day of the adoption. 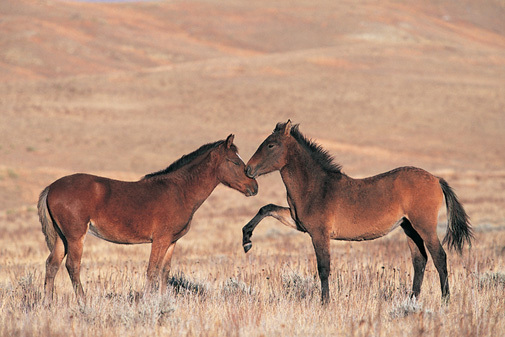 Wild Mustangs can cost between $125-$250. This is also a good time to thoroughly check out the wild Mustang that you are about to adopt.